Finding solutions for problems is popular in politics and business. Morality is not. This blog is about the importance of morality for the quality of services and the continuity of organizations. Ligeti’s Requiem in Stanley Kubrick’s A Space Odessey. 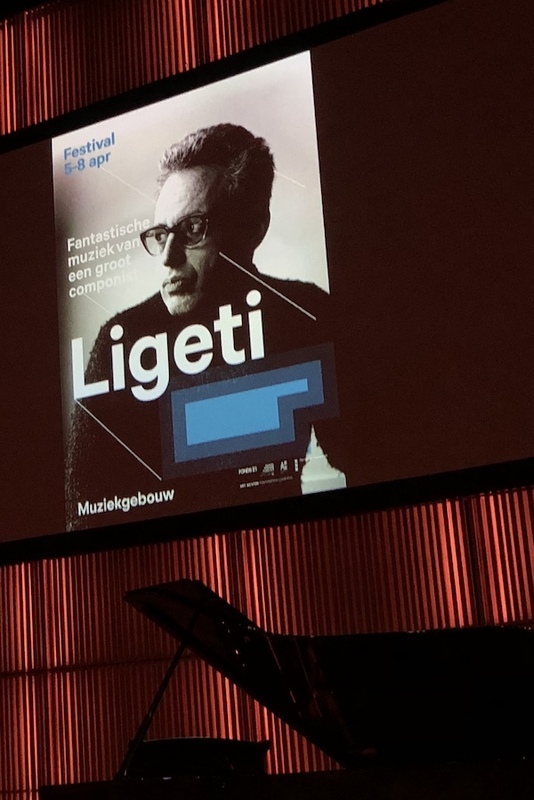 April 5-8 there will be a Ligeti Festival at the Muziekgebouw aan ‘t IJ, with an awesome programme. February 24 2018 was the warming up. Here is a short introduction to his live and music. Reinbert de Leeuw ever introduced me to contemporary serious music: to Shostakovich (Jewish songs), Ives (the silence in music), Antheil (the pistol to make people pay attention to his music), Andriessen (a bass guitar in a ‘classical’ ensemble), Messiaen (birdsongs), Ustvolstkaya (self-will) and yesterday to the Hungarian composer György Ligeti (virtuosity beyond limits). Together with the Dudok Quartet Amsterdam and the pianist Pierre-Laurent Aimard. 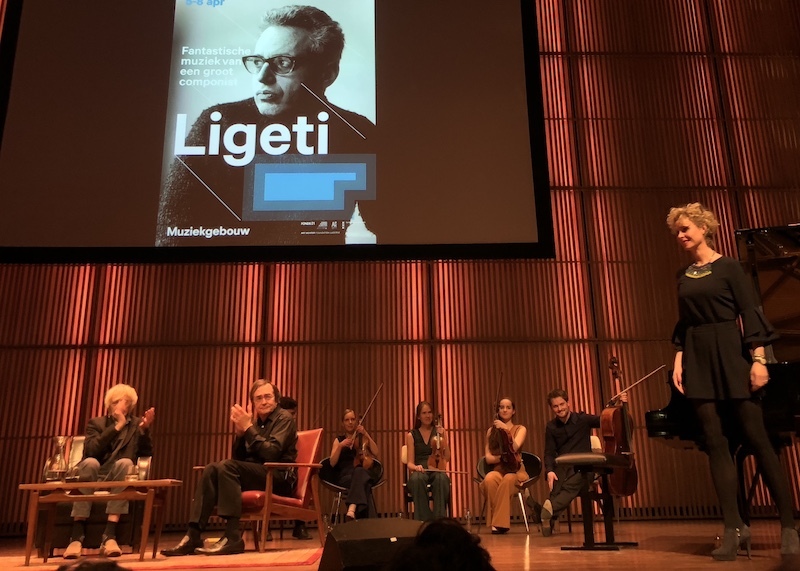 Maartje Stokkers superbly facilited this warming up of the Ligeti Festival, a nice mix of music and interviews. I’ll give you a short introduction to Ligeti’s live and music. Reinbert de Leeuw and Pierre-Laurent Aimard at the left. The Dudok Quartet Amsterdam at the back. With Maartje Stokkers at the right leading the session. I recognize what Reinbert de Leeuw decribes. A few years ago I made the documentary ‘A Life in Hungary‘ with my Hungarian friends. The documentary is about the life of an 92 years old Hungarian woman and how she dealt with the severe system changes in Hungary. She always stayed with herself and was independent in these hard times. In 1944, Ligeti’s education was interrupted when he was sent to a forced labor brigade by the Horthy regime. His brother, age 16, was deported to a concentration camp and both of his parents were sent to Auschwitz. His mother was the only other survivor of his immediate family. Ligeti had his musical education at the Franz Liszt Academy of Music in Budapest. Bartók was forbidden by the authorities of Communist Hungary. Ligeti said he composed musical pieces for the drawer. In 1973 Ligeti became professor of composition at the Hamburg Hochschule für Musik und Theater, eventually retiring in 1989. Ligeti was completely independent. In his view serialism of Schönberg was a dead end street. “In a way Ligeti’s music was nothing anymore, no rhythm, no melody, no pitch” Reinbert de Leeuw told us yesterday. “It is only the tone color.” This was quite a statement at that time. Atmosphères (1961) is a great example. Like Chopin, Liszt and also Debussy Ligeti changed the piano. ‘There is a piano before, and a piano after Ligeti’ Reinbert de Leeuw told us yesterday. Pierre-Laurent Aimard played three etudes yesterday. Probably the most difficult études for piano. Listen to The Devil’s Staircase (étude no. 13). Amazing! This all sounds very serious, but he was not without humor. Listen Slagwerk Den Haag playing his Car Horn Symphony. The Car Horn Symphony. Asko/Schönberg Ensemble and Slagwerk Den Haag will perform this musical piece on April 5 2018. Ligeti urged musicians to play beyond their limits. He didn’t know the word ‘less’. If a musician was playing to the limit he would say “Nein! Mehr!.” as an example, he challenged to play the bassoon with a very very high g (higher than a flute). This is what he wrote in the printed score: “Sure, this one, It’s possible!”. To get any idea, I found this example. But after all Ligeti’s music is virtuoso and so very vivid. In the warming up session the violin player Joseph Puglia opened the Ligeti warming up for the festival. View a part of the violin concerto with Joseph Puglia and Reinbert de Leeuw commenting on it. Violin Concerto by Joseph Puglia and Reinbert de Leeuw. Ready to visit the Ligeti Festival? If you like it or not, it sure will be an experience!